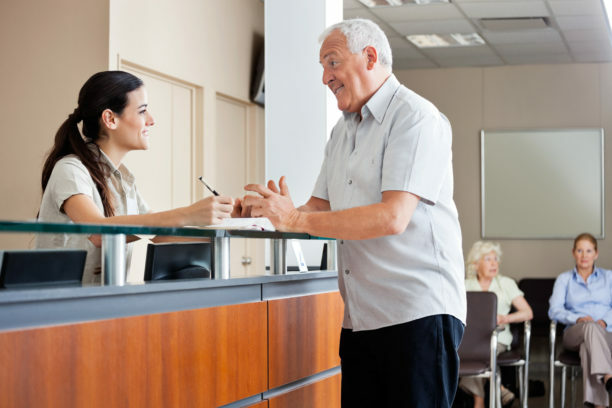 When you grab a patient from the lobby, it’s the first opportunity to make a friendly impression. Please don’t stand at the door and say “Smith.” At a minimum, say “Ms./Mr. Smith” and look around the lobby to make eye contact with the patient as they come to the door. If there is only one patient in the lobby, walk up to them and ask if they are Ms./Mr. Smith. If they are a returning patient, say “Welcome back” when they make it to the door. Ask how they are. Be sensitive to the fact that most patients aren’t ecstatic about hopping on the scale. Use discretion when saying the weight. If they are there for weight loss and have lost weight, praise them for it. When you weigh patients, have somewhere they can place their belongings or offer to hold them. It’s gross to set your purse on the floor of a doctor’s office. Explain that you are going to ask a bunch of questions to help get the most accurate picture of their health. Go ahead and address that the provider may repeat some of the questions to get further clarity. Listen to the patient. Make eye contact. Don’t just look at the screen. Face your screen towards the patient so your face is towards them the whole time. If they are a new patient, this is a great time to talk up the provider. Let them know that the doctor/physician assistant/nurse practitioner is very knowledgable and will take great care of them. Recap any instructions from the doctor with patients and walk them to the spot to check out. Let them know what to do if they have questions once they get home (portal, call, email, etc.). Wish them a happy day or hope for feeling better. Amanda Brummitt has extensive healthcare customer service experience from hospitals, medical practices, and as a consultant. She’s a customer service snob that thinks asking people to be nice isn’t asking too much. She believes the support staff is just as important as the doctor in making sure patients have a positive experience. Walk into your lobby like a patient. See it from their view. Do you have any signs that sound mean? Do you have any signs that sound rude? Do you have a sign that says, “Don’t tap on the window,” “Payment expected at time of service,” or “If you are more than X minutes late….”? Do you have more than two signs in your lobby? If you answered yes to any of these questions, take those signs down. Have you ever seen a sign at a MedSpa that says payment is expected up front? Nope. Let’s treat your patients at least as good as a MedSpa. Your office should be a safe place for patients; not one where they feel unwelcome. Signage should be friendly and welcoming or not exist at all. Promote new services, new providers, social media, or survey tools in your signage…not policies. Patients are customers. Treat them that way. Don’t treat your patients like an inconvenience before they even get the opportunity to talk to your staff. When a customer walks in the front door, the front desk person should make eye contact and smile. When the customer gets about three feet from the front desk, they should greet them warmly. “Hello, how are you?” is a great start. If they are on the phone, they can still smile and mouth “I’ll be right with you” or make a hand gesture to indicate it. Essentially, make sure the customer knows they’ve been seen and acknowledged. Oh, how I loathe the window. If your practice is in a dangerous area and you see patients at night, okay, you can have a window. And, thank you for loving humanity enough to practice somewhere that needs healthcare so desperately. Outside of actual dangerous situations, what is the deal with the window? Are we hiding from patients or what? And please don’t say it’s because of HIPAA. You can absolutely be HIPAA compliant without being closed off to the lobby. I prefer no window. If you have a window, keep it open all the time. If the window is frosted, shame on you. If it’s an overlay remove it. If it’s built into the glass, keep it open all the time. Don’t build barriers between you and your patients. Remove them. And start with that window. 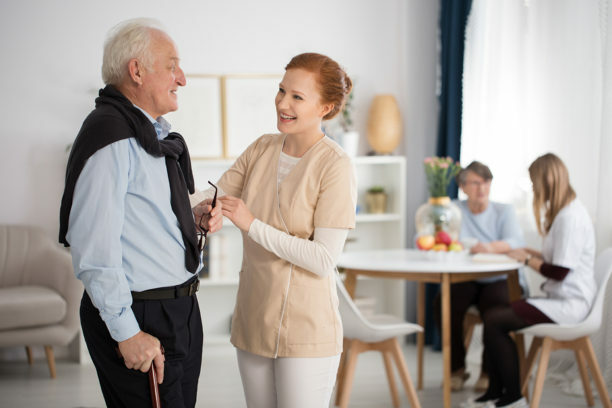 Did you know it is a patient’s right to know the name of the person caring for them and what their credentials are? Every member of your team should wear a name tag every single day, including doctors and administrators. Also, people behave better when they know someone knows their name…because patients can tell on them. Using names also starts to build familiarity. If 100% of your office isn’t wearing name tags now, order them today. High turnover? Fine. Use a label maker for the name/credentials on blank name tags with your logo. If you need help finding a vendor for name tags, we’re happy to share who we use. When checking in a patient, script your staff’s language. My preferred language is, “Hi, how are you? (Pause for answer.) What’s your name?” Say hi before asking for name. And, it’s “your” name, not “the” name. I hate it when someone says, “What’s the name?” Seems so impersonal to me. Want to step it up a notch? Try to remember patient names. Include a pic (even if is the driver’s license picture) in a patient’s medical record. When it’s a repeat patient, look at the schedule and see if you can figure out their name. How much better is it when staff can say, “Hi Mrs. Smith. Welcome back. I’ve got you checked in.” Bam. Service. Or, even say, “Hi! Welcome back. Can you remind me what your name is?” Acknowledging that the person is recognized is HUGE!! Amanda Brummitt has worked in healthcare since 2001 in administration of both hospitals and medical practices. She’s a customer service snob that thinks asking people to be nice isn’t asking too much. She loves secret shopping physician practices, customer service training for clinical and non-clinical staff, and using customer service to improve the patient experience. Can your zip code really be used to determine the future of your health? Where you are located on the map can definitely play a role in the outcome of your health. Population health management has become a very important issue to help reduce healthcare spending and improve patient outcomes. It may be difficult to comprehend, but 20% of the population (Medicare patients) actually drives 80% of the costs in healthcare. If there is a way to effectively manage that 20% of patients, there may possibly be a way to reduce the costs of healthcare across the board. To effectively manage population health, it is necessary to first identify populations who are in the most need of healthcare interventions. The best way to do this is through advanced technological capabilities that allow results to be monitored. Then, programs can be established to improve the health of specific patient populations based on demographics and patient history. One of the first steps is to create a patient registry to help identify segments of the population most at risk. Information should be collected on family background, socioeconomic status, and mental health factors to determine at-risk populations. Both social and cultural factors, as well as genetics and behavioral issues, drive the future of healthcare utilization. Next, data analytic capabilities will be necessary to run analyses on particular sets of patients based on a diagnosis, for example. Some hospital organizations have already begun experimenting with leveraged IT data analytics to improve population health management. By examining their populations thoroughly and understanding where their greatest opportunities were, Aurora Health Care has been able to uniquely identify patients according to disease cohorts. This allows them to predict which populations are at greatest risk for certain diseases. This 15-hospital network in Milwaukee, Wisconsin, is able to share data with primary care physicians to help patients in high risk populations with congestive heart failure and COPD. After implementing this program, Aurora Health Care has seen a 60% reduction in hospital admissions for heart failure-related causes. Through the advancements in population health management, doctors are able to treat patients in the early stages of their diagnosis based on the evident risk factors. Dr. Richard Boehler, CEO of St. Joseph Hospital in New Hampshire, reminds us that “when you take people with risk factors and craft an intervention program for them, it can make a difference in preventing a heart attack or stroke.” By implementing IT systems to more effectively monitor risk factors in patients early-on, people will be more knowledgeable about their own health and be given the opportunity to address their illnesses before their ailments become physically overbearing and costly.